My name name is Heather Bryant and my husband and I own Strand Security, a residential and commercial security alarm systems company. I’m blessed to work with an amazing team and we appreciate our many loyal customers from Maryland to Hilton Head, South Carolina (and everywhere in between). I want to share with you my very personal story about an armed robbery, in hope of bringing awareness to the importance of security and self-defense. It has taken me almost six years to get to this point – being able to tell my story without breaking down. I know it’s time to share it with you though, so that even if only ONE person can learn enough to survive an armed attack, it’s all worth it. A Request For Safety At Work: Denied. Approximately six years ago, I was a manager at a glass front boutique in a metropolitan city. It was a corporate-owned store. As a manager, I was responsible for my employees as we often worked in shifts, all alone in the store. I felt responsible for their safety. I approached corporate to request security cameras and a panic button for the safety of my employees and myself, but there was a lot of red tape. I even suggested that my husband’s alarm company (in Maryland at the time) would donate security cameras and an alarm system with a panic button. Please note: I didn’t go to corporate on a whim. I requested these systems for one important reason. There had been recent armed robberies in our area, one at a jewelry store only two doors down from my boutique. I felt unsafe at work. My requests for an alarm system, security cameras and a panic button were denied. Then one day, shortly after 5:20 PM, a man walked in my store and put a gun to my chest, demanding money. I explained I had to place my fingerprint on the register to actually open it. Ironically, corporate had a fancy fingerprint reader to keep track of employees, but no button to protect employees in the event of an armed robbery. The attacker thought it was a panic button. Oh, I could only wish! It took me a while to convince him that the only way I could give him money was to put my finger on the device. He finally allowed me to place my finger on the reader. I bagged up the cash and rolled coins for my attacker. I put all the money in a carrying bag and handed it over to him. I remember thinking ‘he’s going to leave now’ as it was still daylight. He told me to shut my mouth, cursed at me. He told me I was going to go back into the stock room. At this point, I pretended to go along with his crazy idea. I had no idea how to get out of this situation and only had a few seconds to think of something. One thing that came to mind was I would rather be shot in the store where anyone walking by may see me versus back in a tiny stock room with no windows or doors, no way to escape. I was not going in that stock room with this man and his gun. Period. I acted like I was going to open the stock room door. I knew he would have to take the gun off of my chest at that moment. As he removed the gun while I pretended to open the stockroom, I threw a wood and metal display case over his head. Money scattered all over the floor. The gun was no longer in his hand. My attacker was now furious with me. I fought with everything I had in me. I hoped that if I could just make it to the middle of my store, someone would see us. I kept fighting for my life. It seemed like forever but finally I made it to the middle of the store. At this point, my attacker wasn’t stopping but neither was I. My savior was a deaf woman who peered in through the window of my store and spooked my attacker as she knocked on the glass. Turns out she’d felt the vibrations of the shelves being knocked down and the shuffle that ensued. My attacker grabbed his gun from the floor, left the money and told me he would be back for me as he ran out the door. The police were able to gather enough evidence to make an arrest. He served time. 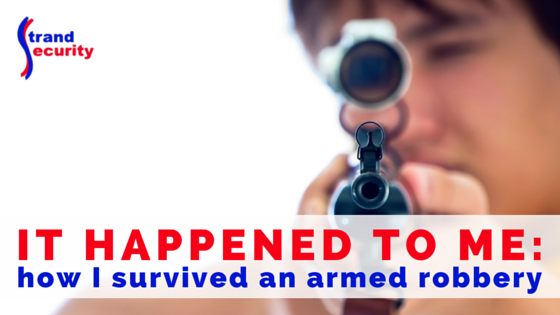 I know with my all heart that knowing and using self-defense helped me survive this attack. I also give thanks to God for sending the deaf woman to my aid that day. Protect those in your care, but first things first. • Learn to protect yourself. • Know what to do when you are attacked. Once you know how to survive, you can help protect your loved ones. Employers; It’s your responsibility to make sure you are doing your best to protect your employees. We at Strand Security will help you with this! Employees; It’s your responsibility to make sure you’re doing your part; take a self-defense class. I would be lying if I said this attack still doesn’t haunt me. I had a great therapist help me work through this. Crowds and loud noises don’t bother me as much. I’m not afraid anymore because I refuse to live in fear. I am resolved to share my story of survival to help others survive. I am now helping others be safe. I’m an advocate in our community for security in businesses and Strand Security has teamed up with a local martial art expert to teach a self-defense class to anyone in our community who wants to learn. PS If you have a personal survival story too and want to share, or if you would like to talk to me personally about your experience, please use this email address.